Home Blog How To Ask Your Doctor For Pain Medication? How To Ask Your Doctor For Pain Medication? Chronic pain is a commonly neglected complaint because patients eventually get used to the pain over a long period of time; it is also one of the most common complaints for which patients seek medical help. Pain is an unpleasant sensation localized to a part of the body. It may be acute or chronic depending upon the duration since onset of pain. Pain is often defined in terms of a tissue-destructive process (stabbing, burning, twisting, tearing, squeezing) or of a bodily or an emotional reaction like nauseating, terrifying and so on. Pain is usually associated with tenderness, swelling and an abnormal increase in sensitivity and response to pain. Pain due to lesions of muscles, joints, tendons, ligaments and bones. Character of pain – Dull, aching or cramping type of pain. Pain affects the entire limb or radiates to some part of the body. Associated sign and symptoms include nausea, vomiting, tenderness, and spasm of overlying muscles. Pain along one or more peripheral nerves caused by damage to affected nerves. Character of pain – Continuous type of pain, burning, aching or bruised pain, paroxysmal shock-like (lancinating) pain. Pain which is maintained by an activity of a sympathetic nervous system Character of pain – Burning, throbbing, pressing or shooting. There is an abnormally increased sensitivity to pain (hyperalgesia) and intense response to non-painful stimuli. Pain due to loss of afferent input (afferent neurons are those which send signals from the central nervous system, that is from the brain and spinal cord to your organs, limbs and other parts of the body) Character of pain – Burning, cramping, shooting, aching or stabbing. There may also be an enhanced response to pain (hyperalgesia) and unpleasant sensation from a simple touch (dysesthesia). Central pain is caused due to dysfunction or some lesion of the central nervous system. Character of pain – Burning, shooting associated with tingling and numbness. Sensory loss may or may not b present. There s an increased response to a painful (hyperalgesia) and non-painful stimuli (allodynia). Pain produced by a single stimulus or a cause can be significantly different in different people and may also vary in the same person on different occasions. It is, therefore, an extremely subjective sensation which cannot be measured. It has been demonstrated that expectation of pain can induce pain in absence of a pain-producing stimulus. It has also been observed that even suggestion of relief from pain can have a significant analgesic effect. This points towards the duality of pain, that is, it can be both a sensation and an emotion. Pain management has gained popularity among healthcare professionals as well as patients in the recent past due to the high prevalence of painful conditions such as musculoskeletal problems and increasing awareness among patients regarding the consequences of untreated pain. Poorly managed acute pain can result in the development of serious medical conditions, anxiety, fear, depression or anger and irritability. Untreated chronic pain, on the other hand, can lead to long-term disability and greatly impact the quality of life of patients. The ideal approach to any case of pain is to treat the underlying cause. Analgesics (pain-killers) are the first line of treatment for any given case of pain. Certain analgesics are however becoming unavailable in the form of over-the-counter medicines. Therefore a common doubt faced by patients is how to ask the doctor for pain medication. Pain-killers often come under the group of non-steroidal anti-inflammatory drugs (NSAIDs). Since most NSAIDs are available over-the-counter, people generally have a tendency to pop a pill and get done with pain. Several cases have been reported where repeated consumption of NSAIDs in unmonitored doses has led to hazardous and even life-threatening side-effects. Also, you need to be extra careful with pain-killers if you are already on medications for some other medical condition. 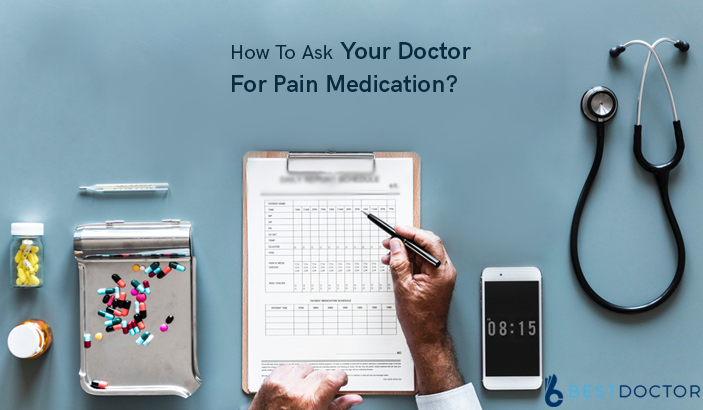 It is therefore important to consult your doctor regarding your condition to get a better understanding of dose and timings of pain medications. Onset Of Pain – How, when and under what circumstances the pain has started. You Need To Identify The Cause Of Pain – When a causative factor for pain is identified, treating it becomes easier. Type/ Quality/ Nature Of Pain – As it has been mentioned above, the character of pain differs when the cause is neurological, tissue destruction or emotional. Duration And Time Of Pain – Since when has the pain started, when is the pain worse and when it is relieved. Intensity Of Pain – Whether the pain is bearable or has it been disrupting your daily activities, does the pain affect your quality of life and under what circumstances the pain becomes worse and better. Your doctor may prescribe you opioids or non-opioids depending on your underlying cause. In certain cases, where the cause is more emotional that structural, you may be treated for your anxiety, fear, insomnia, and depression along with the pain. Along with pain medications, you can also explore other options like yoga, meditation or cognitive behavioral programs to alleviate stress and anxiety associated with it. Also, keeping a regular follow up with your doctor is equally important. Dr. Himanshi is a Homoeopathic consultant and currently working as a lecturer in Post-graduate faculty of Homeopathy, Parul University, Vadodara. Completed BHMS and MD in Homeopathy in January 2018 and also has a clinical experience of about 6 years. Personal interests include reading, spending time with family and traveling. Previous PostWhen To Go To The Doctor For Fever? Next PostWhat To Expect From A Pain Management Doctor? When To See A Doctor For Cold? What Questions Do Gynecologists Ask on Your First Visit? What Does A Rheumatologist Do For Fibromyalgia? When To Call A Doctor For Fever in Baby?